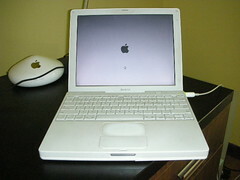 I had an awful morning trying to get my iBook G4 to start. I'd left it sending email last night and when I got to it this morning its screen was blank and it was making a horrible whirring sound. As I'm still in mourning over the demise of Ruby Red my beloved iMac G3, I was slightly freaking out especially when turning it off and on accomplished nothing, and performing a hard restart resulted in a chime, the noise of the fan and a grey screen. After that I tried turning it off again and another Shift-Control-Option-Power restart and I got the Apple symbol up and the power wheel but it just stayed like that for hours. I was about to pack it up and trek to the Apple store when it occurred to be to try one last thing: Pressing the C key while holding down the power button. And it worked. It did take almost fifteen minutes to start up but it's working now. I'm going to be extra nice to it today and not ask it to perform 10 functions at the same time and hopefully it won't let me down again. If it does I foresee a major meltdown in my future.